How to retrieve only the non matching rows from both the left and right table. Matching rows should be eliminated. 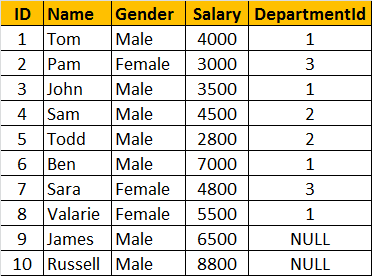 i want to join both of the table and get the all party name , from both of the table of and assigned user ..
is it possible to join one column from multiple column (check the favorable matching value )of another column and show in one table. @ALOK DEO, I think u cannot join the two tables you mentioned in the example because there is no common column in both the tables .When u have a common column in both tables u can get all the users using left join. CORRECT ME IF I AM WRONG !! 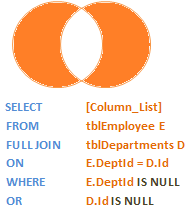 Execute the below lines of code in sql .. u will 20 rows..
First of all thanks to such wonderful explanatory videos. On that note, I have a question. 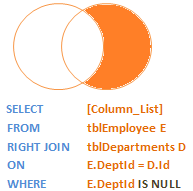 Why these intelligent joins are used as this can be achieved without joining the tables when we actually do not need any information from the other table then just the filtering clause would do to achieve these results. In finding the not matching from left/right in the Venkat`s illustration. 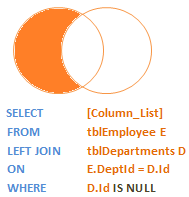 Where clause =NULL is used. I suppose this is considering the two tables related by foreign- primary key. How can we solve this if there is no foreign key relationship ? Or can i use where table1.id != talbe2.id ?